*For practical and safety reasons, do not stack more than two cabinets. Do not place stacked cabinets on a trolley as it may exceed the 900kg load capacity of the trolley, and be prone to tipping over. Exercise care when moving the cabinet. Move it slowly over level floor only. Any obstacle such as a door ledge may cause tipping and result in damage and injury. Always lock the caster wheels when the cabinet is in its desired location. The trays for the Lab Aid® Ultra™ II have been modified. The new trays will be able to store both the slides and cassette blocks in the same tray, eliminating the need to order different trays for different needs. This also allows the lab to use one cabinet to store both the slides and the cassettes. The new trays fit in the former Lab Aid® models. The new trays have 4 rows where slides and cassettes can be stored. A divider is also included with each tray. The divider is removable and can be placed anywhere in the tray, perpendicular to the length of the tray. It may be used to hold blocks and slides upright if all four rows are filled evenly. In case where the user wants to keep slides and blocks in sequence in each row, foam inserts are available separately. Note that the foam will get damaged after a period of use and should be replaced when foam material becomes flakey. The new trays reduce the dead space in each drawer and therefore have increased the storage capacity: up to 22,000 embedded cassettes when two layers of trays are placed in each drawer and up to 96,000 microscope slides. Since 8 trays per drawer are included with the cabinet, using the cabinet for blocks at its full capacity requires the purchase of 4 cases of the trays. Two of the tray corners are raised to help the user pick up the trays when placed in the drawer. These built-in raised corners replace the metal hooks that were required with the old trays. These new trays can be purchased with lids to store cassette blocks and can be stacked on top of each other. In each of the drawers, users have the option of stacking an extra tray with or without lid if only cassettes are stored in each tray. The lid also allows the lab to use the tray as temporary storage. It eliminates the hassle of repacking the blocks to a different box since the tray itself can be used as a convenient transport box. 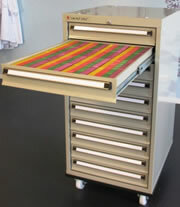 The trolley allows the Lab Aid® Ultra™ II to become a mobile storage system. The trolley can support up to 900 kg of weight. Only one cabinet can be used with each trolley. Stacking cabinets may cause serious injury and damage as filled or partially filled cabinets would exceed the weight capacity of the trolley and be at risk of tipping over. The wheels on the trolley can be easily locked to prevent the cabinet from moving unexpectedly. The white Drawer Identification Strips allow the laboratory to write down the contents of each drawer simplifying retrieval and re-archiving of slides and cassettes. To replace an existing strip, slide out the black plastic insert at either end of the drawer handle, slide the clear plastic protector to access the white strip. Pull it out and slide in the new strip underneath the plastic protector. Re-install the black insert. 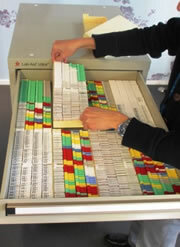 The writeable Coding Strips for trays are used to divide groups of slides and/or cassettes from one another. They aid in reducing the time for searching slides or cassette blocks. In addition to the movable tray divider, the Foam Inserts are used to keep the slides and cassettes from tipping over in a partially filled row. Use as many inserts as needed to fill the empty space. Discard inserts as they become flakey. Lab Aid® Ultra™ II is available online from the EMS Catalog. For ordering or product information, click here.